Ridley Scott’s most mainstream-minded movie in years, The Martian is 80 percent more Apollo 13 than it is Duncan Jones’ similarly themed (but wholly superior) Moon. Like Moon, The Martian involves a Starman (David Bowie’s space anthem of the same name is used tremendously in Scott’s film) contending with crippling solitude and psychological tremors when he’s left for dead on Mars. Unlike Moon, the narrative is a straight-forward locomotive, employing the mantra “I think I can” to such a degree that you can be almost one hundred percent confident that everything is going to work out in the end. Ron Howard’s 1995 space odyssey is the better comparison because both contain A.) Science (and lots of it) and B.) Marshmallow Fluff. The ooey, gooey, duct-tape-of-the-food-kingdom variety. The you-could-crash-land-your-spaceship-it-in-and-all-would-be-fine kind of fluff. That’s not to say that both don’t contain a lick of grit in their space-bound teeth – after all, human lives are on the line here people – but a healthy dose of humor and an overwhelming hunch that everything will turn out A-ok trumps the stakes of the whole ‘man stranded outside the stratosphere’ thing. Like all Ron Howard films, there’s a degree of bold sentimentality to Apollo 13, baked in with the witticisms and distributed amongst its respectable cast, that allows it to appeal to the widest audience possible. It’s not a necessarily “bad” thing. It is worth noting though because The Martian plays a similar game. 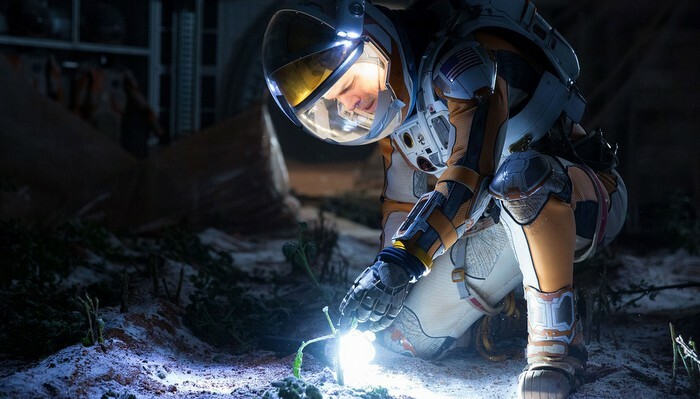 The emotional elements are honed in as if by focus group and the picture proves winning when Matt Damon’s Mark Watney has at his unenviable situation of being left belly up on Mars with a healthy serving of humor, but the broad levity of the flick threatens to let the thing float away. Because if we’re being honest, for a movie about an astronaut stranded 140 million miles from Earth, The Martian oddly lacks tension. There is so much adversity that Watney must face and so much sacrifice on the behalf of the NASA astronauts and scientists on the ground that his ultimate survival is never in question. That’s not to say that a version could not be crafted wherein we are seriously concerned for the well-being of our far-flung spaceman. This just isn’t it. Working from a Drew Goddard script, The Martian moves quickly, chugging from story beat to story beat. As a piece of writing, the film is very obviously adapted from the page as a multitude of pit stops pile on the screen minutes with few getting quite the amount of attention they deserve. A late stage trek through Martian no-man’s-land could have amplified that defining feeling of being stranded hundreds of millions of miles from any other human. Alas, Watney and his jolly space compatriots reach a glass ceiling of emotionality. 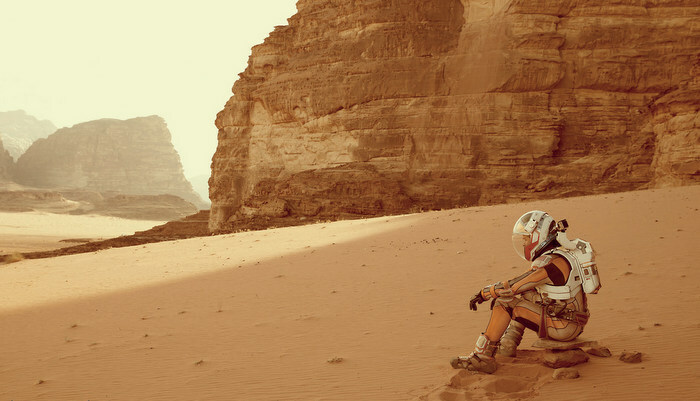 In that regard, The Martian is more Gilligan’s Island than Castaway. That said, Goddard proves ably adept at making gallows humor for the mainstream and Damon’s pissy but perseverant attitude fits Goddard’s script perfectly. As an actor’s showcase, The Martian is a compelling (and ironic) counterpoint to Damon’s last piece, Interstellar. Both involve his character abandoned on a distant planet and yet the characters couldn’t be more polar opposites. While Interstellar’s Damon let the isolation corrode his once great mind, The Martian’s Damon is a bastion of NASA moxie. Able to fix just about anything with some duct tape and vacuum-sealed poo, Watney is Magyver on Mars (Marsgyver?). His can do attitude only works because it’s stirred in with a lion’s share of cuss-laden frustrations. Damon yelps the f-bomb more than you would think possible for a PG-13 flick. And even though he didn’t actually lose any weight for the role, The Martian is still Damon’s best (and juiciest) performance in years. Peering around the screen, audiences are treated to a verifiable who’s who of working talent. 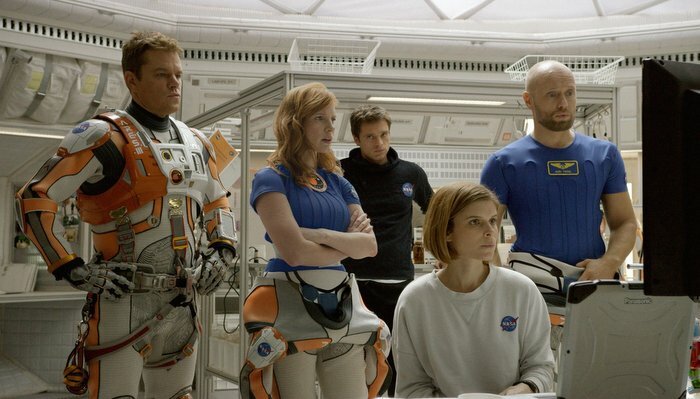 Jessica Chastain, Michael Peña, Kate Mara and a non-starter Sebastian Stan fill the Mars-bound-then-Earth-bound-then-Mars-bound-then-Earth-bound spacecraft. None get the time of day required to really flesh out a character as all of them are left as archetypes and little more. Peña gets to be sarcastic, Chastain injects her Tree of Life maternal nature into the commandeer role and Mara gets to play a science-tastic character who’s basically Sue Storm 2.0. As mentioned above, the Winter Soldier himself might as well have been a CGI monkey in a suit. For a crew who you ultimately end up caring very little for, you forget that he’s even there. Down on earth, a season cast of pros round out the cast with everyone from Jeff Daniels to Donald Glover getting their share of screen time. Daniels is perfect as the crusty director of NASA while rising star Mackenzie Davis excels even when given very little to do. Sean Bean and Kristen Wiig are each left with straight-faced roles while Chiwetel Ejiofor gets the closest The Martian has to being a true secondary character. Sure, we know nothing about him aside from the things that he actions he takes and the compromises he refuses to make, but I couldn’t actually tell you anything about this guy. Or really anyone in the movie. There’s a great episode of LOST where the castaways skip their daily duties and battles with smoke monsters and “the Others” to build a golf course and play 9 holes. They forego the monotony of tragedy to develop their sense of humanity. Rather, the writers do. 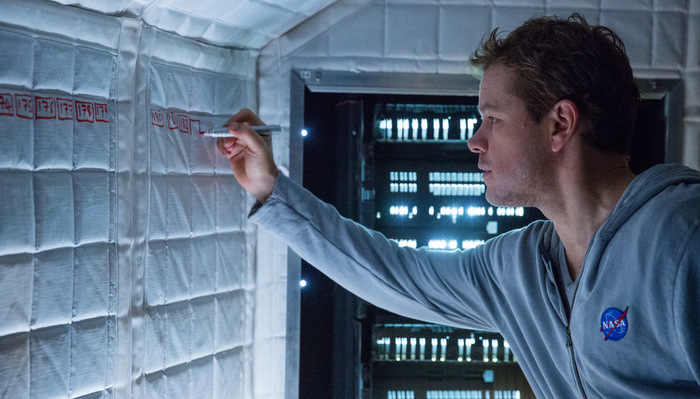 In The Martian, intelligence and scientific gumption are stand-ins for personality. I’m not saying the movie would be better had Watney constructed the first Martian country club… but maybe it would have. All in all, the lack of wear and tear left on a man stranded on Mars solo for years just doesn’t come through. Though the relative weightlessness of The Martian doesn’t fully eclipse its fun-loving spirit, it will leave some audiences clamoring for more. Most however will go ga-ga for its breezy, apparently “scientifically accurate” depiction of a man problem solving for two-plus hours. If you’re in the mood for a space epic that’s narratively light but heavy on smarty pants repartee, The Martian will work wonders. CONCLUSION: A wanna-be prestige picture without the visual glamour of ‘Gravity’ or the emotional oomph of ‘2001: A Space Odyssey,’ ‘The Martian’ is content with being a commendable piece of popcorn-crunching entertainment. This entry was posted in Out in Theaters and tagged Chiwetel Ejiofor, Donald Glover, Drew Goddard, Jeff Daniels, Jessica Chastain, Kate Mara, Kristen Wiig, Mackenzie Davis, Matt Damon, Michael Pena, Out in Theaters, Reviews, Ridley Scott, Sean Bean, Sebastian Stan, The Martian. Bookmark the permalink.